Ferry Corsten has a legacy twenty miles long. His role is an upstanding DJ has not gone unnoticed, keeping him within the list of the Top 10 DJs in the world for many years running now, and his skills on the decks are backed up by his ability to make crowds scream with joy and wave their arms in the air. He is also a renowned producer, having released a variety of records, both in conjunction with other artists, as a solo artist (under various aliases). In recent years, he has shed those various aliases and produced two albums and many hit singles under his own name, Ferry Corsten, including the 2006 album "L.E.F." (which stands for "Loud Electronic Ferocious"). And from that very album came many singles, including "Fire" (which featured Duran Duran's Simon LeBon), "Watch Out", and the single being reviewed here, Beautiful. That was quite a nice description, getting from the bare basics to the specifics, wasn't it! I shall be discussing the vinyl edition of this single here; the CD release featured the Extended Mix but also a radio edit, which is just a shorter version of the Extended Mix, and no remixes. 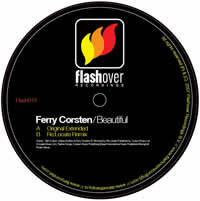 The extended version of the track follows the pattern of Ferry Corsten's new expedition into the world of electro-trance, and does so admirably. Bubbling up with that typical Corsten-style snare and following with a mix of airy pads and tough-but-not-too-tough electro bass, we are soon hit with the distorted female vocals of Debra Andrew telling us that "everything is beautiful". The beautiful (no pun intended, I swear) main vocals, just as disfigured, covers the track as we slowly build up to an arpeggio melody that morphs into a complete electrosymphony. The track works so well together that, in an electro-style world, it could indeed be deemed as beautiful. This, I felt, was one of the finest tracks of Ferry Corsten's album; it is quite stylistic and shows his capability to produce well. The Re:Locate Remix takes a more acidic and classic-sounding approach with more analog synths and a tradition pumping beat. However, ultimately, once you get to the aforementioned arpeggiation, which constitutes one of the major foci of the original song, there is very little innovation or noticeable improvement to be found. Furthermore, the vocals are simply laid over a slightly more reverbed version of that electro arpeggio, and are barely touched. Overall, the Re:Locate remix does not stand out in any audible way over the original, save for a little analog bass around the 4:39 mark. Perhaps Re:Locate believed that the original was good enough that it needed little adjustment. It is clear that the original stands as the superior production, as the remix does not add much to the recipe. However, there is no way I can avoid recommending that you procure this tune any way you can, if indeed this is the style which you prescribe to. Ferry Corsten has proven with "Beautiful" that with experience comes wisdom, and also that with experience can a great ear for a good tune be found. Snag this bangin' tune, or better yet, look for his album "L.E.F. ", which contains this and many others that are of equal worth. Good work, Mr. Corsten!